In June 2007, Brother William conducted The Elijah Challenge Training Seminar at Kuching for Emmanuel Baptist Church. Exactly two years later, my team and I were invited by Brother Raymond Seow, the Missions Director of Full Gospel Assembly in Melbourne, Australia, to conduct The Elijah Challenge Training Seminar at Christ Baptist Church in Kuching. Brother Raymond and Pastor Greman, the Senior Pastor of this Iban church, have been working closely in numerous mission outreaches to the interior of Borneo for many years. For twelve years, Pastor Greman served at Asian Outreach. Then in the year, 2000, God called him to pioneer a church to solely serve the Iban people. With a handful of believers, he launched the ministry by faith. Today, more than 300 Ibans worship at his church that is situated on a purchased property. Kuching is a quiet and beautiful capital city of Sarawak in East Malaysia. Many people know that East Malaysia, which consisted of Sabah and Sarawak, is located on the large island of Borneo. Kuching is a Malay word for cat. So that sparked a legend that it was the English Rajah, James Brooks, who in a miscommunication named the place as Kuching. It was said that he had pointed to the ground and asked his local guide what was the name of the place. Apparently a cat was there and the guide did not understand him and so he said, “Kuching”. Another more credible story was that Kuching was made up of two Chinese words, ‘ku ching’ which means old well. It was said that during a cholera epidemic, it was the clean water of the old well that saved the people there. Whatever the legend might be, today, the well of living water is being offered to the people of Kuching. My ministry team consisted of my wife, Grace and her parents, Brother and Sister Ong, who are qualified Elijah Challengers. 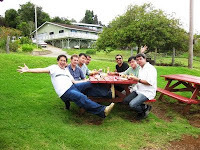 Brother Jason who is a student from Kuala Lumpur also joined us in this ministry. The Australian team, headed by Brother Raymond, consisted of eight people. Some of them have received Elijah Challenge training with Brother William while a few are new to this ministry. Yesterday was the first evening of the Elijah Challenge training at Christ Baptist Church The brightly lit sanctuary was quickly filled with more than 100 Iban Christians. This was the first time that my team and I ministered to this special people. Pastor Greman, who is an Iban himself, told us that the Iban tribe is a part of the Dayak race that forms the largest population in Sarawak. Since the last century, many Ibans have become Christians. However, some of them are still involved with animism and dabbled with black magic. Pastor Greman said that reaching out to the tribal people in Sarawak has become the priority of his congregation. Unlike most Baptist churches that I know, the worship here was very vibrant. The congregation clapped and sang with all their might. Some even raised their hands. After a short introduction, Pastor Gremlin invited me to teach. Grace was up on the balcony controlling my slide presentation. My training slides had both English and Indonesian scriptures. I was not able to secure the Malay scriptures online and so had relied heavily on the Indonesian bible. Grace, who is well-versed with the Malay language, had translated many of the didactic portions into Malay. We were told that the Ibans understood the Malay language better than Indonesian one. Pastor Greman was a very gifted interpreter and helped me interpret my teaching into the Iban language. He was able to portray the intensity of my message with both vigorous non-verbal and voice inflection. The participants were very responsive. Even though the session was long, I did not catch anyone sleeping. These participants were serious in learning Power Evangelism. When asked how many had cast out demons, many raised their hands. The Iban Christians have to content with many demonic activities among their own countrymen. In the past the Ibans were among the famous headhunters of Borneo. They also practiced witchcraft and black magic. Thus many of these evil spirits from these practices were passed down through the generations. When Christianity came to the Dayaks, the missionaries and local Christian leaders had to contend with the demons. Today, this power encounter continues – every time when the gospel is preached, many of those who are steeped in these ethnic animistic religions would manifest demons. During the time for demonstration of healing, there were about 12 people who needed divine healing. I asked for chairs to be placed in the front of church and the infirm quickly filled all the seats. Pastor Greman instructed his Christian leaders to come forward so as to learn how to take authority over the diseases. As they positioned themselves, I gave some basic instructions on how to heal the sick. They were told to open their eyes at all time. They were not supposed to pray but utilize their kingly authority by commanding the diseases and demons to go. I also told them to lay hands as close to the affected areas as possible. If there were to be manifestations of demons, the victims should be quickly ushered to be ministered in the prayer room. No deliverance should be done at the front of the church. The reason is because, in our experience, demons love to show off. In the presence of spectators, they will resist coming out of the victims. Since this was the first time that many of these participants were learning how to heal, there was an air of nervous expectation. The first command was given and after checking every ‘patient’, we discovered that everybody, except one, received some kinds of relief and healing. They said that they felt better. Then we went onto the next round of authoritative commands. This time, Pastor Greman took over and gave the commands in the Iban language. The people repeated after his commands and miracles happened. A lady who had lungs problem found that her lungs had cleared up. After she testified, she shook my hand and gave me a thumb-up sign. A teenager received healing of her back and leg pain. Another girl was healed of sore throat. Pastor Greman then led in another string of commands. His voice was clear and firm. His people repeated his commands and faith shot up. Many mountains moved last night. The lady who had pain and discomfort in her abdomen was healed. Before the healing, I could see that she was grimacing in pain. After the healing, a gentle smile broke over her face. This was enough reward to me. Just to see the mercy of God healing the infirm and making them whole makes my effort here worthwhile. A young man who had knee injury testified of his healing. Two men with back pain also did so to the glory of God. A man, with problem in the joint of one of his thumbs, testified that the thumb had become flexible and could bent without much effort. A man with pain in his jaw was healed. So was the man with a hip problem. He was healed and tested his healing by bending and twisting his waist. Throughout the healing session, I did not lay hands on a single person. The purpose was to avoid the misconception that I was the ‘superstar’ healer. My emphasis was that God had also given all the Born-again participants the authority to heal the infirm and preach the Gospel. On too many occasions when I tried to help in the healing, the crowd came to me instead of going to the participants. Somehow, the people always have this notion that the preachers have more power than the rest of the participants. As far as I know, I do not have the gift of healing but only possess the same authority of healing as is given by God to all Born-again believers. It was a very good evening of healing experience. After the service, some members of the Australian team were still exercising their faith in healing the infirm. I thank God for His mercy upon all of us. I believe that after this Elijah Challenge training, many of these Iban participants will go into the interior and heal their relatives and friends while sharing the Good News. The well of living water is indeed providing spiritual refreshment in the midst of the Iban community. DP is a Christian leader from India. One day, before breakfast, I saw him walking with difficulty down the stairs. Upon asking, I found out that he had a bad accident before and so his legs hurt when he climbed the steps. He consented to be healed and in the name of Jesus I took authority over his legs. I did that for about four times and after each time I asked him to try walking up and down the stairs. He did and he praised God that his legs felt much better. Today, he is walking without the difficulty as compared to what he had felt before. Praise the Lord. Sasha is a pastor from Kyrgyzstan. 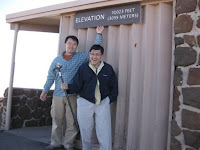 During our Sunday trip to the Haleakala National Park, he suddenly had a bad headache. When we visited the Visitors' Center, he choose to stay in the car. I offered to "pray" for his headache. 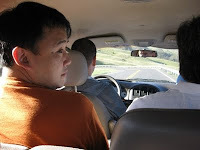 As he was sitting at the back of the car, I turned and laid my right hand on his forehead. I rebuked the headache sternly in the name of Jesus. Sasha immediately felt relief. On the second command, his headache was gone completely. He was thrilled and later was able to testify in class to the glory of God. Valdnei is a Christian leader from Brazil. While we were shopping at Wal-Mart, he told me that he had a headache. So, we stopped by the side of the shopping aisle and I laid hands on him. In spite of other shoppers looking at us and wondering what we were doing, I commanded the headache to leave in the name of Jesus. He immediately said that he was well. However, after he walked to the next aisle, he said that the headache had returned. So, once again, the authority of God was exercised. Valdnei smiled in his own inimitable way and proclaimed that he was completely healed of his headache. One of the shoppers, who looking at us, also smiled and gave a thumb-up sign. We praise God that Jesus could heal us anywhere and at any place. Before the Regional Presentation last Wednesday, Igna who is a Christian leader from Indonesia was supposed to play the role of an Indonesian fisherman. However, he complained of dizziness and decided that he needed to rest. Upon hearing the news about his illness, I rushed to his room. Igna was most willing to receive the healing from the Lord and I could see his faith. As I commanded the dizziness to go, he was feeling better. By the fourth time, he felt well enough and stopped me from continuing. However, he felt that he should still rest. I went for the Regional presentation, thinking that we may not have a fisherman in our play on that day. When the Brazilian team and the Central Asian team presented their presentation, Igna walked into the authoditorium. He told me that he was well enough to play his role. He did a great job in the presentation. Praise God for His mercy and healing power upon our brother. I praise God that Jesus has given us authority and power to heal the sick, raise the dead and cast out demons when we preach the Gospel. I pray that all our brothers from 19 countries will exercise their authority to heal and do miracles when they preach the Gospel. All we need to do is to exercise faith and exercise the authority given by our precious Lord and Savior.